With Movienizer you can manage information about your movies and TV series. But the program also provides information about actors, directors, screenplay writers, composers. 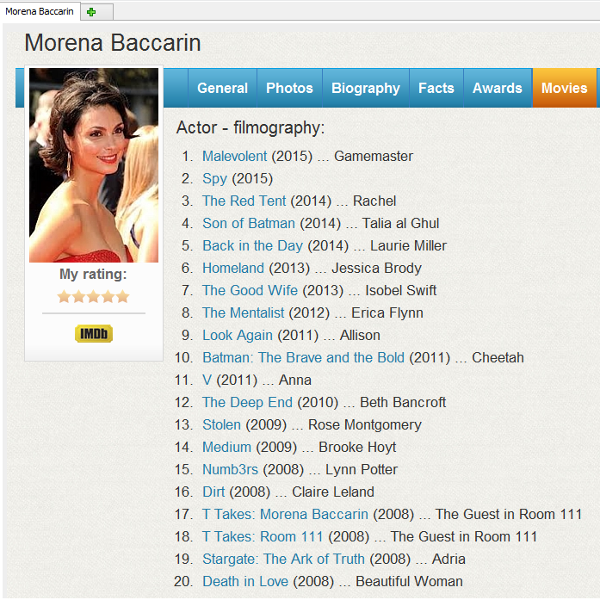 When you download information about an actor, the complete filmography of the actor can be downloaded (depending on your download settings and selected information source). This movie page contains only very basic details: movie title, release year, and the name of the actress, whose filmography led us here. We can hit the "Download" button and download information about this particular movie / TV series. This will fill out our usual set of fields. However, if we want to check all movies of a favorite actor, downloading information for each of them separately will require too many movements. We can do that much easier, downloading movie details for a complete filmography in a couple of clicks. All movies from the filmography of the actor /actress are listed here. You can select them all by clicking the box with the checkmark in the upper right corner, just above the list. To unselect all movies, click the empty box. To select or unselect individual movies, click boxes in the list, near the corresponding titles. Select movies automatically. This defines how many movies are selected automatically when you open this window. You can adjust this number as necessary. Add movies to the collection when downloading information for them. If this option is enabled, Movienizer will add to your collection all movies that it downloads information for. If you do not have these movies in your collection, you may want to disable this option. Download info about the movie from the internet. You can find more information about this option here. The feature of downloading movie details for all films of a filmography works only if you use the same information source both for people and for movies (for example, IMDb).